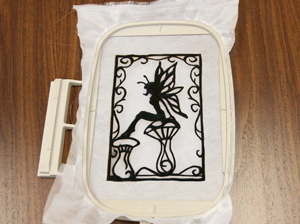 Looking to bring your embroidery to life in a new and magical way? 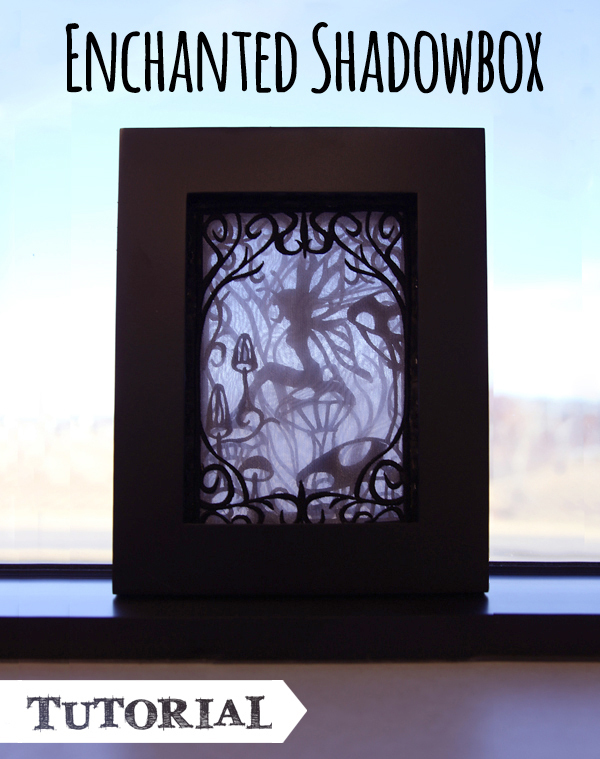 This enchanting shadowbox effect is a delightful way to let your design shine in your windowsill for all to see. 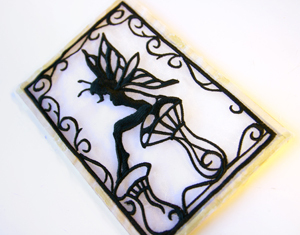 It’s easy to put together and has a simply magical effect! How you display your layered scene is up to you! 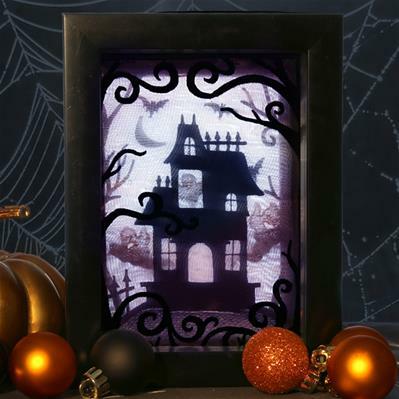 The easiest way to go is with a regular photo frame, but it’s not totally necessary, as you can set the shadowbox in a window, or backlight it with a light source to turn it into a nightlight. 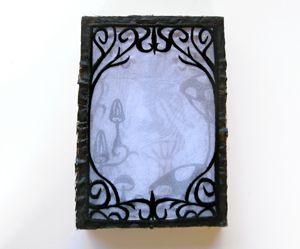 The 5" x 7" design will conveniently fit into most standard 5" x 7" frames. 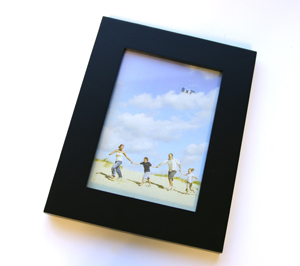 The 4" x 4" design will require a much smaller frame, such as a 2.5" x 3.5" or 3" x 3.5" photo frame. In order for these designs to be able to "layer" one on top of the other, you need a white or light colored organza material to stitch them on. We recommend using a heavy duty water soluble stabilizer, such as Sulky Ultra Solvy or Vilene. Hoop both fabric and stabilizer together taut, in the smallest hoop possible for the design. 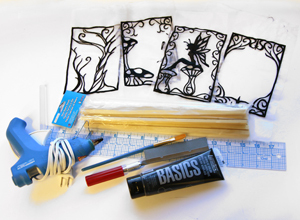 Change your bobbin thread to match your top thread color and embroider the design. 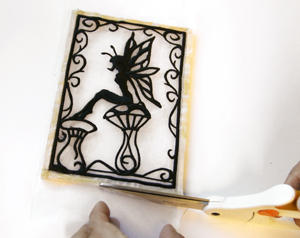 Soak away the water soluble stabilizer and let dry completely. Don't cut your organza fabric just yet! We first need to build "frames" for each of your panels. 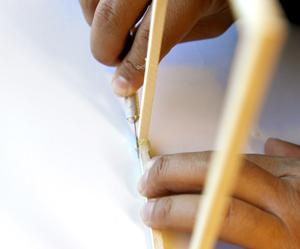 Start by marking out on your wooden dowel where each wood piece should end. 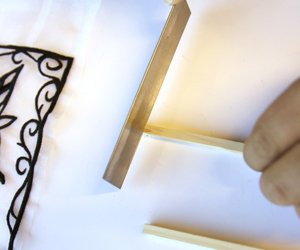 You want your wooden dowels to sit just outside the length of your satin frame border. Now cut your wood pieces to size with your handy little hobby wood saw. 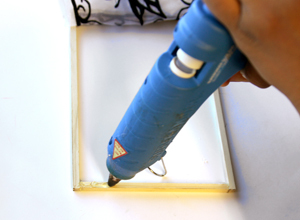 Use hot glue and to adhere the wood pieces together at 90 degree angles to make your frame. Let dry completely. 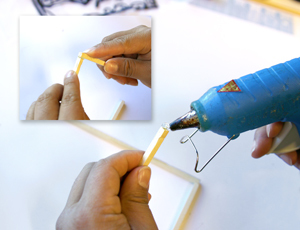 Use a knife to remove the excess glue on the edges. This will help each layer sit more neatly against each other. 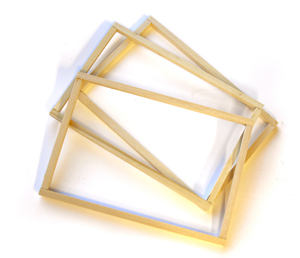 Make a total of four wooden frames. 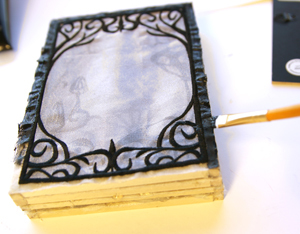 To add your organza panel, start by running a line of glue across the top bar of your wood frame. Place your organza panel along the top, lining up the top satin edge with the glue border. Carefully smooth it along so it lines up with the wood edge. Note: We recommend leaving a little bit of excess organza around the edges so you can pull them tight to the frame while you’re gluing. Afterwards we can trim off the excess. Also, be careful while gluing -- hot glue is hot! Let it sit for a moment until you’re totally sure that top edge of glue is dry. Next, run a line of glue across the bottom frame edge. 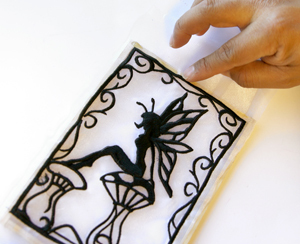 Stretch your organza panel down and smooth the bottom edge along the glued bar. Try to gently tug it into place, pulling the organza taut and removing some of the slack in the fabric. That will let each panel sit as smoothly as possible. With the top and bottom edges glued in place, you can now seal down the sides in a similar fashion. 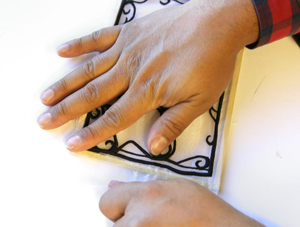 Pull them gently but firmly to get as smooth a panel as possible on all sides! 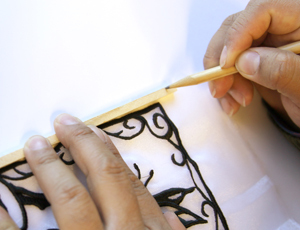 Once your panel is all glued in place and dry, you can trim off the excess fabric from all the edges. Now you just repeat it three more times, until each embroidered piece is stretched out nice and neat to its wooden frame. With all four frames set and made, it’s time to combine the layers. 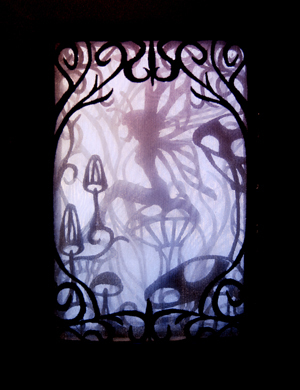 The Fairy Scene was designed for the trees to be the back, followed by the fairy, then the mushrooms, then the open frame. This will give you the best readability on all layers. 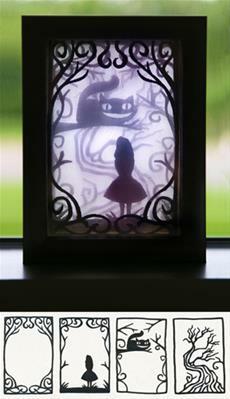 However, you can put your shadowbox together however you like! Whatever order you choose, lay your bottom layer facing up, and add a line of glue all around the edges of the wood. Take your next layer and carefully place it on top, lining up the edges to make it as perfectly flush as possible. Gently push down on the wood so the two layers glue together firmly. Continue this until all four layers are stacked and glued on top of each other. For a polished look, hide the organza and wood edges with a quick coating of paint. 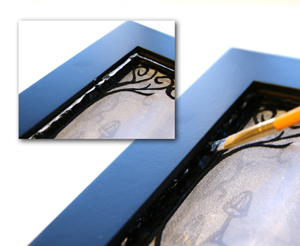 We matched our thread color (black) to our paint and frame color for a sharp, classic look. You only really need to do this on the top layer. 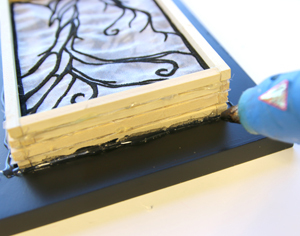 Once your top layer edges are dry, you're ready to add it to your frame. Remove the backing from your frame. 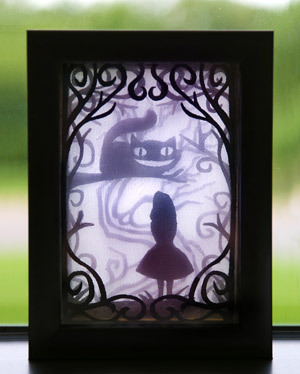 Place your shadowbox right side down on top of the opening, and carefully center it so it’s showing neatly through the opening. 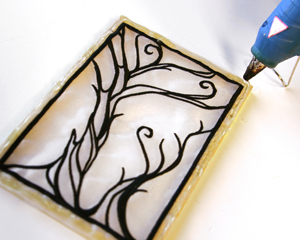 Once it’s in the right spot, use hot glue to run a line around all of the edges, sealing it in place. 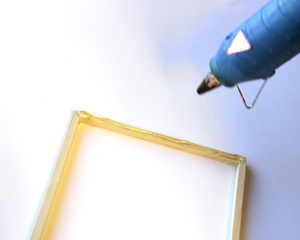 Make sure your frame is completely sealed up with hot glue, to avoid gapping between the embroidery and the frame. It helps to then add a layer of paint inside the edge, making that "gap" vanish into the darkness. TIP: Glue can leave a glossy finish, so you may have to add one layer of paint, wait for it to dry, and add a final coat to get a nice matte look. 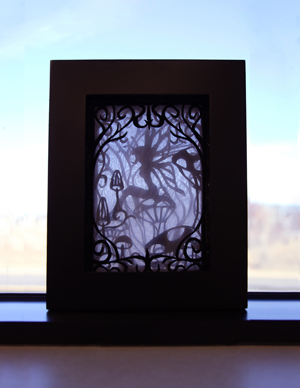 For maximum effect, set your box in front of a window -- the ambient light will really make it glow! 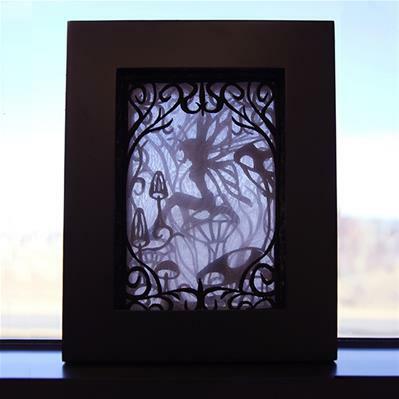 You may also add a backlight to your shadow box, with fairy lights or a flameless candle and use it as a moody and elegant light at night. However you want your creation to "glow" is up to you! 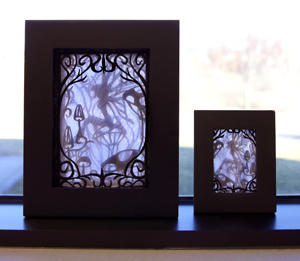 This fun shadowbox project comes in two sizes, 5"x7" and a cute 4"x4". Both are constructed in the same way. 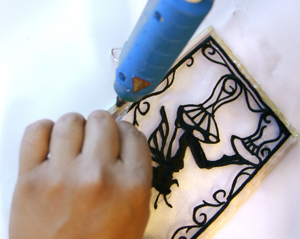 Enjoy the enchanting effect of your new glowing embroidery project, sure to stun any passer by. Who knew such magic was possible with an embroidery machine? 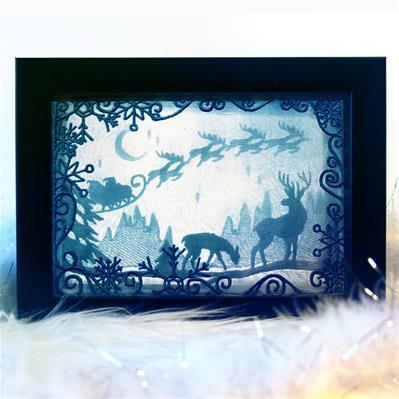 Add the Wonderland Scene to your enchanted shadowbox collection, available now!